Pu'u Kole is a prominent red cinder cone to the east of the Mauna Kea Visitor Information Station. Pu'u Kole literally means "hill of red earth" in the Hawaiian language because of the deep mahogany color of the cinder cone. This hike follows a seldom-used four-wheel drive road initially and then requires a difficult off-trail hike to gain the summit. The views from the top of Pu'u Kole are incredible: you have an perfect vantage on Mauna Kea and Mauna Loa as well as the expanse of the Saddle Road region. On a typical day you can expect to hike thousands of feet above the clouds below. This is a great adventure in an area of the island that few people see. If the sign-in station at the information kiosk at the trailhead is accurate, this road averages less than one person per week, whether on foot or in a vehicle. This hike is a great place to find solitude. Trailhead: From either side of the island, take the Saddle Road, Hwy. 200, to the Mauna Kea road near the 28 mile marker. The road is well-marked. From the turn, follow the paved road for six miles to the Ellison Onizuka Mauna Kea Visitor Information Station (MKVIS). You can either park at the MKVIS or turn around and drive a tenth of a mile to a large dirt parking area near a double-sided information kiosk. The kiosk contains information and regulations for off-road drivers. Sign in at the trailhead kiosk even though you're on foot and not in a vehicle for safety purposes. Gear: This hike is located high on the flanks of Mauna Kea near 9000' above sea level, so expect temperatures lower than almost everywhere else on the island and extreme weather. Bring winter gear, sturdy boots, and plenty of extra food and water. Although the hike is along a four-wheel drive road, it gets very little use so you'll need to be completely self-sufficient out here. This area is shared with hunters, so wear some brightly colored clothing or commercial hunter's orange blaze when hiking, especially when hiking off of the main roads. Hike: If you parked at the Mauna Kea Visitor Information Station, walk downhill for a tenth of a mile and locate a large dirt parking area with a double-sided information kiosk. From the the kiosk, find Road R1 departing to the east. Follow R1 as it gently descends the eastern flank of Mauna Kea. Along the way, notice the sign that advises off-road drivers to stay off of sites that are sacred to the Hawaiian people. Even though you're on foot, you should heed the same warnings. Continue along Road R1 as it descends with huge views of Mauna Loa and the Saddle Road region. You'll notice Pu'u Kole on the skyline with its deep red color. Eventually come to a flat area and find a road intersection where Road R1 turns north and Road R2 continues east. Leave Road R1 and take Road R2 to Pu'u Kole. Road R2 cuts east on the north side of Pu'u Kole and ends abruptly when the terrain gets rough near the Pu'u. From where the road ends, hike due south toward Pu'u Kole off trail. You'll need to negotiate a extremely rough ʻaʻā lava field shortly after leaving the road. 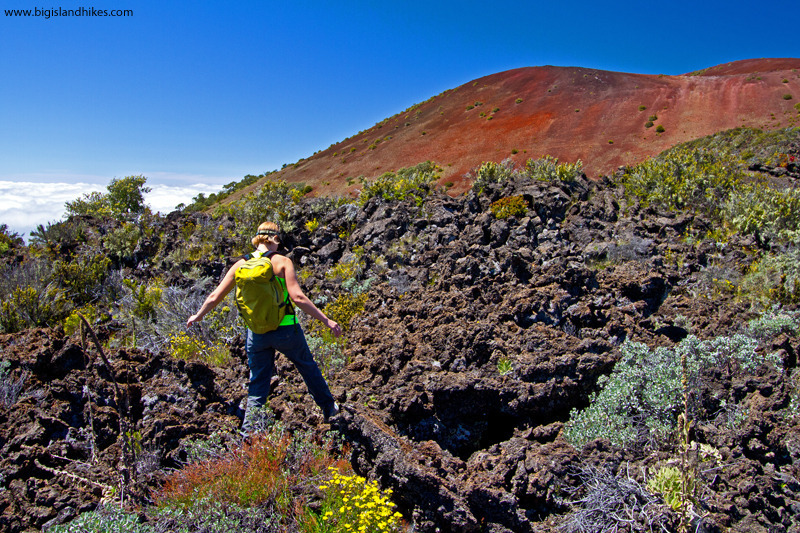 Thisʻaʻā field contains a few deep holes and cracks obscured by vegetation, so take your time and determine the safest and easiest path to the cinder cone slopes above you. After passing this lava field, climb directly up the loose, open slopes of Pu'u Kole for three hundred feet. There are some sparse grasses that grow on these slopes, so ensure that you climb on open rock and stay off any vegetation. The loose slopes make for very slow going. Eventually gain the summit and bask in the views. Return the way you came. The return trip to the trailhead involves gaining 650 feet of elevation, so leave some gas in the tank for the way home.